What's great about the site, in Chelan, is that it has a great mountain launch with a dramatic exposure of the Columbia River Gorge and XC possibilities to the South, East and North. To the East is a high plain of some of the best XC flats I've ever flown. Unlimited landing spots, epic climbs to above 10,000', and dusties that you can see for 20 miles make this a place to remember. 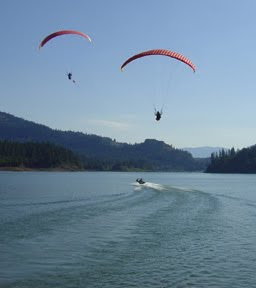 Following the Chelan XC Open, Chelan will host the first PWC (Paragliding World Cup) event to be held in the USA in 12 years. 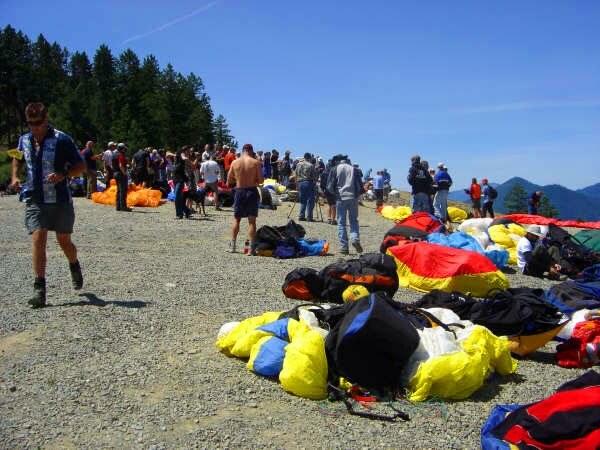 PWC events attract the best pilots from all over the world and are the highest level of Paragliding XC competition. I am really looking forward to flying with the best and brightest. This will also be my first opportunity to see the newest, exotic 2-liner wings from Ozone, Niviuk, and SOL. Chelan looking South, with launch on the right and the flats to the left. I will be flying my new Gradient Avax XC3 which is a new Serial Class wing, and lower performance than the majority of the wings entered in the PWC. My goals and expectations involve getting to goal every day and making good decisions while learning all I can about tactics and strategies from the great pilots I'll be surrounded by. I will be posting regularly, while flying in this great competition. In August we will travel to Sun Valley, Idaho for the US Nat's. I've never flown Sun Valley, but the site looks great. This event will also be a Pre-PWC event. In prior posts I went through a few scenarios and recommended some possible solutions and procedures to consider when faced with these abnormal situations. The main thing we are after, in looking at these situations is the ability to think and fly while working through the problem to it's safest outcome. As mentioned before, all of these equipment and grey-matter failures can be avoided if you are conscientious with your gear, preparation, and anticipation of potential danger. You huck off the hill with your brakes held in your normal way; When you pull the right brake, the handle separates from the brake-line, and your brake-line trails 10 feet behind you as you fly along. No Problem. You will still have plenty of control to safely get on the ground. As your instructor (probably) told you during training, you can use your rear risers to control the wing. Because you want similar control pressures, I recommend using both rear risers rather than using one brake and the opposite riser. Be careful since the force required to control the wing may be different than that normally experienced while using brakes - consider the possibility of stall/spin, if over controlling. Practice rear-riser-flying your wing every once in a while to familiarize yourself with the flying characteristics and control pressures associated with using the rear risers for control. 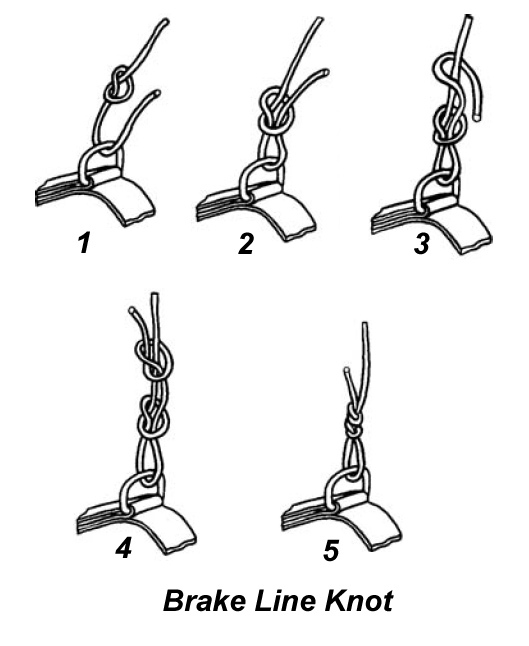 When you tie your brake line knots I recommend using the knot shown in the graphic here. Click on the graphic for a larger version. You are attending your first SIV course, held at a local lake. The instructor is a well respected acro pilot who gets right to the description of how/what/where you are going to do the maneuvers. You excitedly hook into the tow-line and are soon airborne. The boat tows you to about 200', when you feel the line go slack and you see the boat slowing until it's dead in the water. This may sound a bit far-fetched, but I've seen a variation of this happen at three different towing events. Any time you combine a boat, a winch, a long towing line, and a wing, you add innumerable complex failure points and something is bound to happen. This means you need to be prepared and all parties need to have a plan. When on tow, and the line goes very slack, (you realize something is ending the tow prematurely) your first thought should be to disconnect from the tow-line. You may need two hands to accomplish this task since the force has been removed from the line. Your priority should be to clear yourself from the tow-line. Then steer towards a suitable landing spot while considering the wind. If you are in a position where landing in the water is the best or only option, get as close to another boat or shore as possible. If your safety boat has been disabled you may be in the water for a while. You should be wearing a good life vest. You should have removed the padding from your harness so you float face-up. You should have a hook knife readily available. And you should have a plan if you hit the water without the aid of a rescue boat; because. . . The very reason you are heading for the water, may be the reason the rescue boat won't be coming to your aid! If you are fouled in your lines, you are in serious danger, since no rescue boat is coming. Scenario 7 covered some of the things to consider, and preparations to make, when landing in the water. You may think that the water is your friend since the whole reason for the course being held at the lake is so you will land in the water if the wing gets out of sorts - but the hazards of the water are as real as any other time. So - Here's the way to preemptively avoid the above situation. If your acro-god instructor doesn't brief you (and the boat driver) about the tow pattern and the importance of a path that allows for a landing on shore if a low rope-break or boat malfunction occurs, you need to take responsibility for your safety, and do the briefing with them. If, as is the case most of the time, your tow-boat is also the safety boat, there is a gap in safety if the boat is disabled due to engine or winch problems. You shouldn't be exposed to a water landing for any longer than necessary, early in the tow. The best-case scenario is for you to be towed along a landable shoreline until you are high enough to return to a designated LZ. If you find yourself headed for the water then all the caveats mentioned in Scenario 7 apply. For some very sobering information, see this excellent study done by the DHV. It is obvious, from this study, that a timely arrival of the safety boat is imperative to a safely run SIV course. SIV courses are very important in advancing your flying through increased familiarity and confidence in your ability to handle your wing in all situations - I value my time over the water greatly - but be aware that it is essential that your SIV is conducted by professionals who have good equipment and good procedures. That's me. I'm waiting for my new Gradient Avax XC-3 to arrive. The early reports are very positive and the performance is being touted as 'much better' than the XC-2, which I was very impressed with. When I ordered the XC-2 (3 years ago) I was concerned that it would be too hot for me. I was very happy with the handling and benign flight characteristics and it was perfect for my stage of development, as a paraglider pilot. Now, I'm ready for anything that Gradient can get by the EN-D testing. And I'm ready to enjoy the great handling I've come to expect from the Gradient team. I won't be worried about competing against the ultra-specialized, exotic, 2-liner comp wings rolling off the factory floors - I'm a serial guy, and happy to be flying a little less performance with much better handling. I didn't want to complicate my order, so I went with the stock blue colors. It should be here within a couple weeks. I plan to fly it in the US Nat'ls in Sun Valley in August, and the PWC in Chelan, WA in July. The XC3 is advertised as having a better-than 10:1 glide ratio with a nice wide speed range that exceeds 60Kph accelerated. The 6.8 aspect ratio is right between that of the XC2 and the Boomerang 5 I flew this year. The 3-line configuration eliminated almost 25% of the line length (read drag) and it looks like the line diameters haven't been increased substantially, like they have been on the 2-line designs. Here's a nice video of the XC-3 in flight. The 2010 Rat Race begins this week in Ruch, Oregon. This paragliding competition is a great event that is geared to the newer XC pilot who wants to experience the competition scene in a less intense and more instructive environment. A mentoring program pairs experienced pilots with those who are new to the sport. Safety is emphasized and tasks are designed to provide challenging but safe routes through the Oregon hills. Unfortunately my work schedule doesn't allow me to fly this comp in 2010. Fly Safe and have fun! For those of you looking for a map of the waypoints in the Woodrat area, HERE is one I built a few years back. If you haven't seen it yet, I've written an article geared to newer XC comp pilots and it can be downloaded HERE. The official Rat Race Website is HERE. I hope the week is as instructive and enjoyable for you, as every Rat Race I've flown has been for me. “Climb if you will, but remember that courage and strength are nought without prudence, and that a momentary negligence may destroy the happiness of a lifetime. Do nothing in haste; look well to each step; and from the beginning think what may be the end”. In my last post I emphasized the importance of 'pre-thinking' about your reactions to abnormal and emergency situations. I continue that theme in this post. Again, these are all situations that are avoidable. Do your best to use good judgement to avoid the necessity to employ these procedures. Due to circumstances, (blown back, climbed into a position where you can’t make the ‘normal’ LZ, malfunction that requires a quick landing, etc.) you are going to land in a LZ that is not familiar to you. Congrats! You just went XC! • Wind direction – Pick a field that allows a landing into the wind. • Obstructions and crops – Consider rotors downwind of obstructions. Also choose a field without nasty vegetation and expensive crops. If you must land in crops, attempt to minimize the damage you cause by landing near the edge of the field, or on a road within it. • Slope – This is secondary to wind direction since it is possible to side-hill land or even land uphill. Landing downhill can be problematic and create an ‘overshoot,’ so pick as level and large a field as possible. • Wires – Assume the field has wires in it and around it. Look for structures adjacent to the field and look for wires to the structure. Also consider fences when evaluating the field. Barbed-wire fences tend to attract wings after a safe landing. • Livestock – Ideally, you want to choose a field without any animals in it. Failing that, land as far away from the livestock as possible. Horses are particularly skittish so talk to them as you make your approach and make an attempt to avoid over-flying them. • Extraction considerations – Look for alternative fields if, for example, you notice a river without bridges between you and the road. While you are looking over your options, consider a secondary field that you may opt for if your primary choice proves, later, to be unsatisfactory due to wires, crops or other factors. If you discover on short final, that your field has wires across your path, you must react quickly to avoid hitting the wires. If the electricity doesn’t kill you, the fall will certainly hurt. Consider these alternatives. Land X-wind or downwind to avoid the wires. B-line stall to increase your descent angle into the remaining space prior to the wires. Pick the softest looking trees, bushes, etc. rather than fly into wires. If necessary, consider your gear as expendable. It is better to shred your wing or harness than to wreck your body trying to save your gear. Landing ‘off-field’ should become something that is not intimidating at all. I consider it to be a valuable skill that needs to be practiced by everyone. Consult your instructor for the first few, though. You launch and soon notice a tendency of the wing to turn to the right. Counter steering and wt. shift are sufficient to fly straight, but you have some serious controllability issues. First, fly away from the hill to provide ground clearance and time to resolve the issue. Use minimum brake inputs since you may be very close to the stall point. Next, remind yourself (by looking and touching) the location of your reserve handle – If you need to toss your reserve this quick review will serve to minimize your response time. 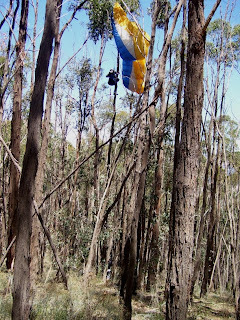 Consider flying over an area that is ‘friendly’ to coming down under your rescue canopy. Also consider that your glide ratio may be degraded by the drag created by the deformation of the wing. Head directly for your LZ while you assess and try to remedy your situation. Now let’s assess the situation. Look at your wing and notice any obvious dimpling of the lower surface. Look for lines that are snagged. Look at your risers to see it the carabiners and speed system are all normal. Use the eyes of your mates to indicate any noticeable defects from above. You probably have a knot in your suspension lines. Often you can clear a knot by carefully pulling the affected lines and letting them (‘twang”) loose. It may take a few tries – but be cautious, you may cause the wing to spin if you are pulling enthusiastically on one side. Another possibility is that your speed system is hung up on one side. This should be evident by looking at the risers. You might try to activate your speed system (gingerly) to see if that clears the problem. Another possibility is that your brake line has fouled. It isn't uncommon to launch with the brakes wrapped in the 'D' lines and this can cause a restriction of the brakes at the pulley. If controllability to a safe landing is in doubt, consider using your hook-knife to cut the offending brake-line, speed-bar line or rear suspension line. If clearing the cause of the asymmetry is unsuccessful, then I recommend landing in the largest LZ available. Make your approach as conservative as possible and consider that your controllability may change when slowing for touchdown – even stalling much earlier than normal. Consider landing in a large field without a flare. An advanced ‘last resort’ technique, which one should only attempt if controllability is really in doubt, and you have a healthy clearance from the surface, is to execute a full stall to release tension on the lines and then pull them tight. 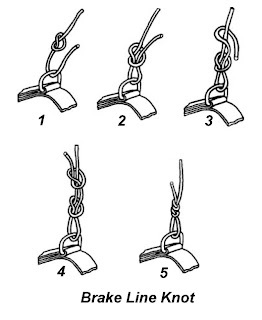 If the knot doesn’t come out, the result may be an abnormal recovery/cascade event that will result in a reserve toss. Due to a gross miscalculation, you are going to land in the trees. Plan your approach so that you impact near the central trunk of the tree. Ideally you should impact with the tree with your legs crossed at the ankles and slowed with a full flare 4-10 feet above the tree branches. Once the noise stops and you complete your string of expletives, assess your situation. If you are hanging above the forest floor, get secured to the tree. Grab a good branch, then tie on to it as quickly as possible using whatever is available. If there is a possibility of your wing being re-inflated by wind, then do what’s necessary to secure it. I recommend carrying a tree kit (which is accessible while strapped into your harness). It will contain enough webbing to attach your harness to the tree. If you are secure, you might consider waiting for rescue as the safest course of action. If you decide to exit the tree, be sure that you have sufficient equipment to go all the way to the ground - if not, stay put. 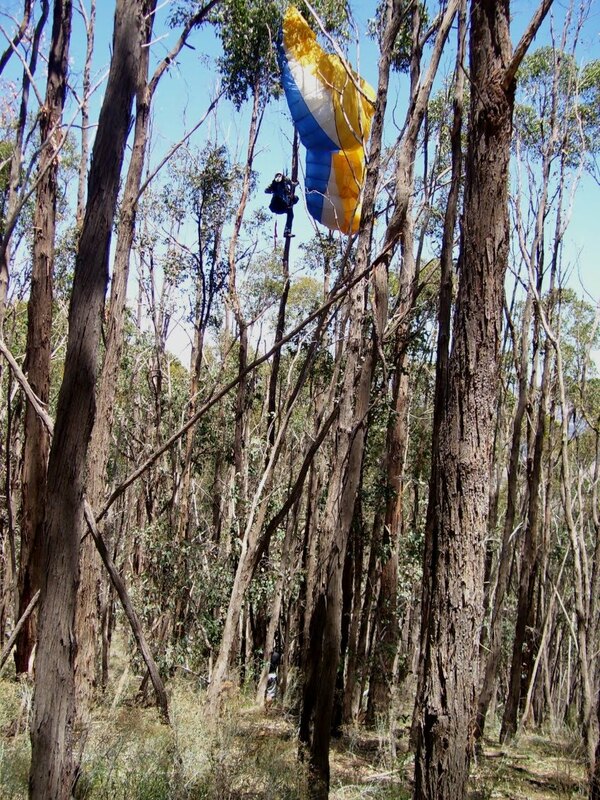 Some recommend using the reserve parachute lines and bridle to climb down from the tree – I wouldn’t recommend using this method higher than you care to fall. You can decide your options based upon the gear you have accessible, your situation in the tree, and the distance to the surface. Options to consider are: rappelling from the tree (anchor) while in your harness; rappelling from the harness (anchor) using a separate climbing harness or diaper harness; or even climbing down the tree. HERE is a great article that explains the hazards and methods of extracting yourself from a tree. At the very least, have a spool of dental floss in your pocket to lower to the rescue crew. It can be used to pull up a climbing rope. I highly recommend practicing with your tree kit under controlled conditions. It is trickier than it looks to rappel from the tree and rig the harness for rappel. Due to a gross miscalculation, you are going to land in the water. Just as is a ditching in my airliner, this is a nightmare scenario. The following applies to any water landing, but is particularly true in any type of surf. Your chances of death, when landing in the midst of 30sq. meters of sail and 300+meters of spectra lines, is quite high. You should do everything in your power to avoid a water landing - almost any other scenario is preferable to landing in surf. This includes crashing in an unsavory place and risking injury. Bear in mind that I am a strong swimmer and this scenario is still VERY intimidating because the gear you are wearing; helmet, boots, multi-layers of clothing - all soak up many pounds of water and will effectively exhaust and drown you. . . Carry a hook knife and keep it readily accessible. Once it is obvious that you will be landing in the water, plan your approach so you will hit close to the shore in a (preferred) downwind direction. By flying downwind, you are assured that the wing will overfly you and not come down on top of you. Prior to landing, at an altitude of about 50’, you should remove the brake loops from your wrists, disconnect your leg straps and chest strap, and remove any cockpit attachments (if you think they will hinder your evacuation of the harness). Plan to fly into the water with no flare, to allow the wing to overfly you. Simultaneously rock forward out of the harness, dive down and escape laterally (towards shore) so as to avoid any lines. Rid yourself of clothing and footwear as soon as you are clear of your lines - You are going to be exhausted in an amazingly short time. Forget about saving your gear until your safety is assured and you have help. It is amazing how heavy a wing full of water is. If you don’t believe these cautions, watch the video below. This is Part ONE of THREE in this series - Links to the next part are at the end of this page. I’ve spent much of my life in simulators; often practicing “worst case scenarios.” While practicing the handling of these types of situations, I work with my crew to utilize the procedures that have been practiced and designed to ensure the proper response. We also discuss alternative courses of action. It’s not pessimism that drives this behavior – it’s a healthy respect for the value of mental preparation. I believe that a similar mindset is valuable in our flying of paragliders. Even if you never leave your home site, and never land anywhere but your own LZ, “dry flying” - thinking abnormal scenarios through, can be good practice. All of the scenarios in this post are situations that are best avoided in the first place. Use proper preparation and judgment, and you will eliminate the need to deal with these situations. It is still of value, however, to consider what you would do, to avoid panic and brain-lock, should you encounter them. Rule number one is KEEP YOUR HEAD. Don’t stop thinking just because you are confronted with an abnormal situation. There is a way to handle the situation to minimize your peril and maximize a positive outcome. Rule number two is TAKE YOUR TIME. Often the time for ‘immediate action’ has passed – Now you need to make a considered reaction to ensure a safe outcome. You are soaring at 100 meters (300’) over launch, along your ridge site when the wind picks up suddenly. You realize you are parked and unable to penetrate into the wind. What to do? Assuming that your normal LZ is upwind and below launch, your first course should be to increase your speed to penetrate into the wind. Use of your speedbar will achieve added ground speed. If the air is rough, you may not be able to use your speedbar to its full extension, but use as much as you safely can to achieve a visible groundspeed into the wind. As you get in front of the ridge you will often leave the lift band that can increase the velocity of the wind as it is compressed over the ridge. You will soon note an increase in your groundspeed. If you are still parked while accelerated, or unable to use speedbar due to rough air, then you need to explore your other, less attractive options. You might want to consider descending to the level of the slope in front of launch and side-hill landing. You may need to land using big-ears to pull this off. It is often possible (since the wind may be slightly less than 90° to the ridge) to creep along, parallel to the ridge, so as to get to the end of the ridge and get to an alternative LZ next to the ridge and/or downwind of the ridge. It also may be a viable alternative to fly over the back to land downwind of the ridge. You must take into consideration that there may be sink and rotor caused by the wind flowing over the ridge. You can increase the viability of this choice by utilizing lift on the ridge to get high and choosing your spot to go back carefully, to maximize the distance from the ridge of your landing. Generally landing as far downwind as possible is your best bet. Why not take the next thermal over the back and embark on a cross-country flight? This is a far better choice than panicking and rushing the reaction, or attempting to get to your normal LZ in a vain attempt against the wind. You get the idea? We need to consider these options so they come to mind when you realize you’re in a pickle. You have had a great flight and are landing in a stronger wind than expected or comfortable. First, plan to land in a LZ with sufficient room to allow for downwind drift, should it be encountered. Next, plan to land in the upwind 1/3 of the LZ if this has clear air. When dealing with a lot of wind near the ground, consider any obstructions that may create rotor turbulence. Make an approach to the LZ that allows you to maneuver without turning away (downwind) from the LZ. Your approach should be made with the minimum necessary speedbar. If speedbar is used, then plan to touchdown with minimal bar and then kill the wing by pulling down on your “B” or “C” risers. An optimum way to achieve a nice high-wind landing is to lean forward slightly, with legs extended and risers ready to pull, so a PLF may be achieved or a quick turn may be made while pulling the “C” risers to kill all lift. A video of such a landing can be viewed below. I opted to make the approach and landing without speed-bar since none was necessary. If speed had been required, I would have landed on the beach since it afforded a bit more space. High Wind Landing from Tim O'Neill on Vimeo. An alternative procedure that I have not employed, but I’ve heard can be successful, is to twist 180° and land while facing backwards so any downwind drift may be handled by running backwards while killing the wing. You are thermalling up in a nice thermal, when suddenly you realize that you are in rapidly increasing lift and may be sucked into the cloud above, soon. As the thermal rises, and the air reaches its dew-point, the increased energy of the thermal can reach a point that causes a climb much faster than intended and anticipated. Prior to being lifted into the cloud you should attempt to exit the area of lift. The best way to do this is to roll-out and fly in the direction of the closest edge of the cloud (and the adjacent clear area). You should have noted the nearest clear area while well below cloud-base since you will not be able to see which direction is best while close to the cloud. If necessary, use speed-bar and big-ears to increase your speed and sink rate, to evade the lift. If you have a compass or GPS, use them to provide heading information. If not, then use the sun as a reference and hold your heading relative to the sun, if possible. It may be best to hold this heading even if you are lifted into cloud since horizontal escape of the lift is the best method. Alternative methods are to use descent techniques prior to reaching the cloud. Big-Ears + Speed-bar, Spirals, and B-Line Stalls are often employed to decrease the effect of the lift. When exiting these configurations however, you may find yourself climbing in the lift again. That is why I recommend the first technique. If you find yourself in cloud, do not panic. It is disorienting and vertigo may be experienced, but you are not in trouble unless you just flew into a 35,000’ thunderstorm. Just remember that a paraglider has more inherent stability than most flying machines so a hands off approach will suffice to allow you to exit the cloud. If you can safely fly with some speed-bar, then I recommend you use it to expedite your exit from the cloud. Be patient – when you get into the sink, you will soon exit the cloud. A note about spirals - Spirals are a very effective descent technique, but need to be practiced. I recommend you get with your instructor, or better yet, an SIV coach, to practice ‘throttling’ your spirals so you can effectively modulate the G forces and descent rate. Part 2 is located HERE. If you have any suggestions, drop me a note.